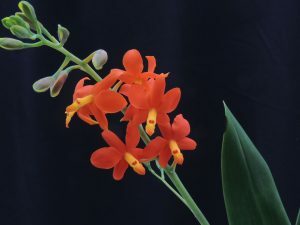 Yesterday’s trisitella species is the kind of orchid that needs searching for but todays species is one of our most startling orchids with its very bright orange flowers, a colour not common amongst our plants. The plant is native to cool pine and oak forest in the mountains of Mexico, Guatemala, Honduras and Nicaragua but we find it does best for us in Warm Americas with good light but well watered throughout the year. 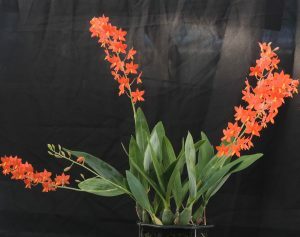 It has many features that identify it as humming bird pollinated – bright orange flowers, no scent and flowers well clear of the foliage to allow easy access for birds on the wing. The dark pollen cap shows the point for beak access to the nectar. The leaves have an unusual grey waxy coating which is presumably protection from the sun and to prevent water loss.